1 package of lemon pudding already prepared, do this first and cool. Sift together flour, 1/2 cup sugar, baking powder, salt, zest and spice. Cut in shortening until the mixture is crumbly. Add egg and milk; mix just until moistened. The batter will be thick. Fold in peeled, chopped oranges. Spoon into greased muffin tins about 3/4 full. Bake in 350*F oven for 20 to 25 minutes, or until the muffins are done. Combine 1/4 cup brown sugar and cinnamon. Dip muffins with sugar/cinnamon mixture. 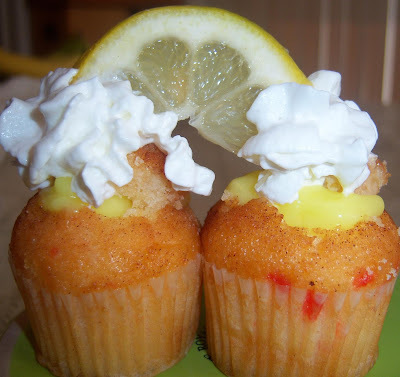 Cut the center of the muffin out and fill with a prepared packaged lemon pudding. Put tops back on and garnish with whipped cream. Oh I wish I was a baker. These look wonderful! They look so good! I'd toss some lavender in just for the aroma and more of an earthy feel, but absolutely delicious looking!